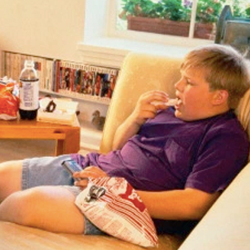 The evidence to date suggests that screen media exposure leads to obesity in children and adolescents via three main mechanisms: increased eating while using screens, leading to greater calorie intake; seeing advertising for high-calorie, low-nutrition foods and beverages that alters children’s preferences, purchase requests, and eating habits; and disrupting sleep. Monitor your children's media use for content. Exposure to high-calorie, low-nutrient food and beverage advertisements and marketing influences your children's preferences, purchase requests and consumption habits. Obesity is also linked to reduced sleep duration. Turn off your children's media 1–2 hours prior to bedtime, remove the screens from their bedrooms and understand how much sleep children need at different ages of their development in order to ensure that they get an adequate night's sleep. Robinson TN. Reducing children's television viewing to prevent obesity. JAMA 1999;282:1561-7. Robinson TN, Saphir MN, Kraemer HC, Varady A, Haydel KF. Effects of reducing television viewing on children's requests for toys: A randomized controlled trial. J Dev Behav Pediatr 2001;22:179-84. Robinson TN, Wilde ML, Navratil LC, Haydel KF, Varady A. Effects of reducing children's television and video game use on aggressive behavior: A randomized controlled trial. Arch Pediatr Adolesc Med 2001;155:17-23. Matheson DM, Wang Y, Klesges LM, Beech BM, Kraemer HC, Robinson TN. African-American girls' dietary intake while watching television. Obes Res 2004;12:32S-7S.